A Doppler is a device used to listen to the flow of blood through an Artery. 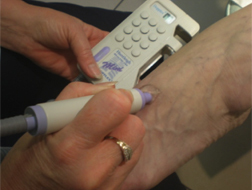 In Podiatric Medicine we use this equipment to help assess the status of a patient’s circulation to the foot. The pattern of the sound can be a reliable indication of the health of the Artery tested i.e. 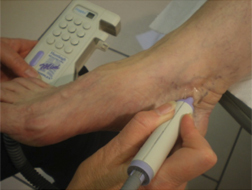 if the Artery is ‘furred’ thus reducing blood flow to the foot. A healthy sound would be two or three separate noises in quick succession (Biphasic or Triphasic). Unhealthy arteries would exhibit a single ‘swishing’ sound (Monophasic).